Jon Gruden is the winner of what might be the largest jackpot ever given to an NFL coach. Gruden is now the coach of the Oakland-Las Vegas Raiders, and you have to wonder what Nevada residents really think of Raiders owner Mark Davis getting $750 million from the Nevada governor and state lawmakers to help build his business’s new home. Davis took the generous Nevada offer because he thought he had an opportunity to make more money and take some of that money and invest it in the business. The stadium will cost $1.9 billion, Raiders partners are putting up $650 million with the state and other investors chipping in the rest. Davis is assuming a big risk though in putting up $650 million. 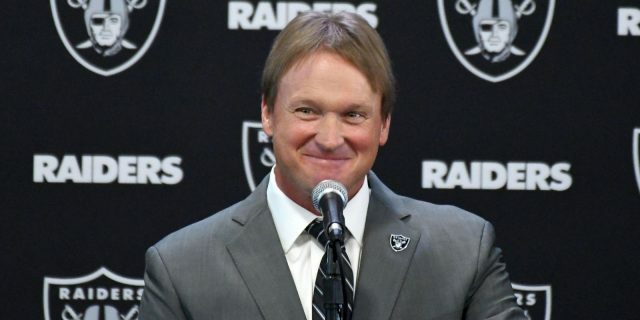 Without the largest public subsidy in the history of stadium building in the United States, Jon Gruden would not have gotten the very, very rich deal. Davis must feel Las Vegas will be a goldmine because he would never have been able to sign Gruden to a lucrative deal staying in Oakland. The NFL does have a salary cap for players but none for a coach, coaching staff, scouting staff and other front office personnel including promotional people. Clark County and Nevada residents have educational and infrastructure problems and apparently don’t have enough money to fix roads yet through various taxes are helping to pay Gruden’s salary. Raiders’ ownership is getting to keep every penny generated in the stadium from luxury boxes, to club seats, to signage, to restaurants, to parking. The Raiders stadium will not have a sportsbook on the premises and there will be no sexually-themed advertising partners putting their business names up anywhere in the stadium. Davis’s Raiders business will also pick up some money from the University of Las Vegas’s football team usage of the stadium. Nevada residents hit the daily double, a stadium and a big debt. Next articleNightengale: Can Baseball Keep ‘Can’t-Miss’ Kids in the Game?